A genetically engineered raccoon and a regenerating, tree-like humanoid, Rocket and Groot make for a one of a kind duo - not sure what kind, but definitely one of a kind. 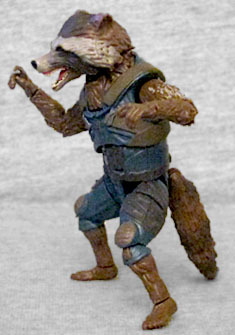 The last time we reviewed a Rocket Raccoon toy, we didn't know whether the public at large would embrace the idea of a talking raccoon. We compared him to Jar-Jar Binks, in fact. But Marvel apparently knows better than George Lucas, because everybody loved Rocket. Everybody. Your grammy, your aunty, your momma, your mammy... people who have never read a single comic know Guardians of the Galaxy and "that cute little raccoon fella." And though at first it seemed we wouldn't be getting a figure of him from the sequel, Series 2 of the figures comes through! Rocket changed his costume for the second movie, trading the tiny orange jumpsuit for a tiny blue jumpsuit - hey, there's no need to get drastic, right? The sculpt is just as good on this toy as on the one from three years ago, though none of the parts are reused. Go figure! The cut of his suit is the same, covering everything between his knees and his neck, while leaving the arms bare, but the small details are different. He has little round kneepads, a belt, some clasps on his stomach, and a harness that runs around his shoulders. His fur is thick and bristly, so that it actually looks like fur at this scale. You even get your choice of two heads this time: one with the mouth open, one with the mouth closed. The sculpts are otherwise identical - only the lower jaw is different - so you must wonder if they were at one point intending that to be a moveable joint, and just couldn't make it work. If that's the case, it must have been a real doozy, because the rest of Rocket's joints are so small and dainty! He has a balljointed head, swivel/hinge shoulders and elbows, swivel wrists, a balljointed torso, swivel/hinge tail, swivel/hinge hips, swivel thighs, swivel/hinge knees, and swivel ankles. They packed more articulation into this toy than they've ever given a Rocket before! If you have trouble standing him, you can still use his tail as a tripod. His feet pull out pretty easily, but they do it without breaking, which is what really matters. And swapping the heads is simple and painless. 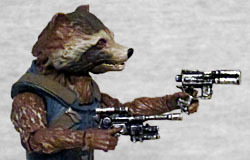 He comes with two pistols, the ones he picked up on the Ravager ship. One is a tripled-barreled number, while the other looks suspiciously like Han Solo's blaster with a few extra pieces glued on. They're both given a silver drybrushing, and can be held in either hand. We do wish he'd come with a larger gun as an option, but there's still a lot more in this box. For instance, Baby Groot! There was already one baby Groot available, in that TЯU exclusive set, but this one is different: he's wearing his little Ravager uniform! Aww, so adorable! And sad. Sadorable? He stands slightly more than 1¼" tall, which may be a little oversized for the scale, but it's not enough that anyone should care. He's got a perfectly dopey look on his face, and his spacesuit is detailed nicely; it even gets a gold paint app for the zipper. Since they are both so small, Rocket and Groot come with the entire torso of this series' Build-A-Figure, Mantis. Her dress looks like leaves. 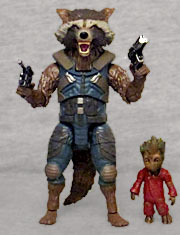 I should have known better than to think this toyline would skip Rocket entirely - he's the angry, furry face of the franchise, even if the happy sapling is more merchandisable. 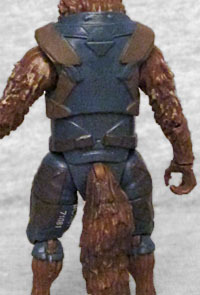 This could have been a repaint of the existing toy, but Hasbro did better than that.